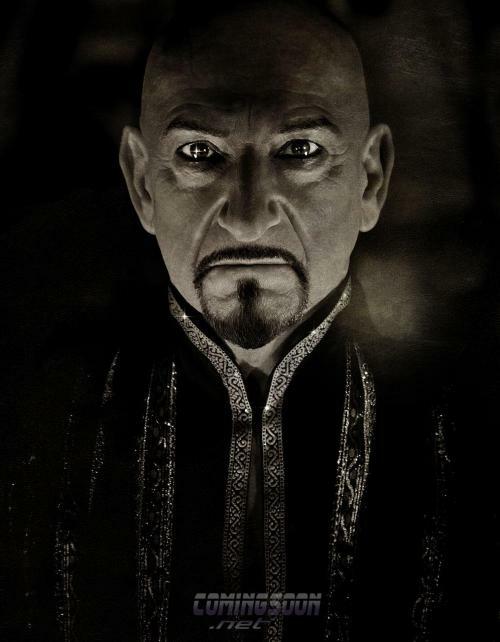 Just to clar­ify, Dis­ney recently announced a slew of “Dis­ney Dig­i­tal 3D” movies com­ing out in 2010. Prince of Per­sia was included in that list. It’s inclu­sion has since been con­firmed as a mis­take by Walt Dis­ney Pic­tures contacts. Prince of Per­sia was filmed in 2D and will be pre­sented in 2D, there are no plans to dig­i­tally adapt it into 3D, a process many dis­agree with. We had a sneak pre­view of a Prince of Per­sia movie poster via a shop win­dow reflec­tion in Con­fes­sions of a Shopa­holic, said poster does not resem­ble the oddly futur­is­tic ones recently released. The intense black and white posters are gar­nished with strong typog­ra­phy that I don’t rate highly — it feels some­how that they have missed the point? “Deny the future”. Although some are argu­ing that this stops the movie look­ing like a video game to movie adap­ta­tion — it is sleek and slick and could help the film find its audience. Expect a Ben Kings­ley poster shortly, not our first view­ing, but this one is par­tic­u­larly men­ac­ing! Scoop via Com­ing Soon. Thanks Suzy, Jerry, Javier and Ivan! If any of you decided to watch Con­fes­sions of a Shopo­holic you may have missed the Prince of Per­sia movie poster flash­ing in the reflec­tion of the cab, do not fret, TTeba has con­tacted us with a clip show­ing that very scene. The poster itself looks very rem­i­nis­cent of the video games. The por­trayal of the Prince in the movie seems to be an inter­est­ing com­bi­na­tion of pre­vi­ous games, as one reader points out — the movie is enti­tled ‘Sands of Time’ — in the first look video we see Jake dressed in a white robe — sim­i­lar to the 1989 prince and we also see clips of him donned up in the War­rior Within prince out­fit. And now in this poster there is a hint of the Two Thrones char­ac­ter portrayal. 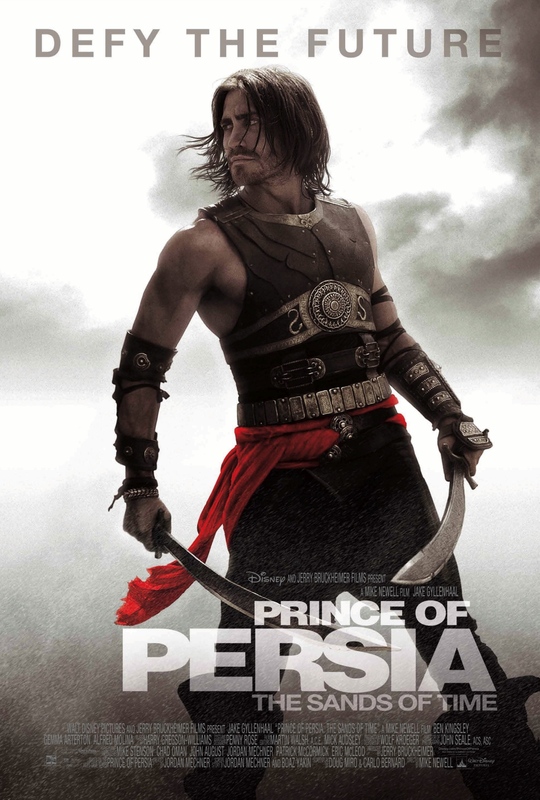 Fans look­ing for a first look at the poster art for the upcom­ing, “Prince of Per­sia: The Sands of Time” will have to head to the movie the­ater to see it, though it won’t be in the place they might expect. Mega-Producer Jerry Bruck­heimer has hid­den the poster inside his lat­est film, “Con­fes­sions of a Shopa­holic”, appear­ing as a Times Square adver­tise­ment about halfway into the film. It joins posters for a num­ber of other Bruck­heimer pro­duc­tions, includ­ing the upcom­ing “G-Force”, though “Per­sia” is unique in that it marks the first time the films’ art­work has been seen anywhere. 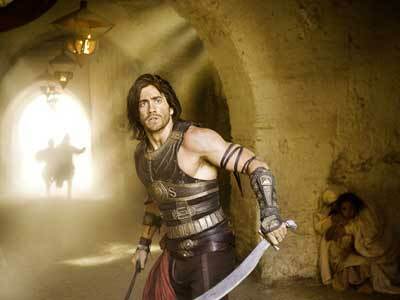 Promi­nently fea­tured on the poster is lead actor Jake Gyl­len­haal in full-costume as Prince Dastan. Dis­ney has today announced that the Prince of Per­sia movie adap­ta­tion will no longer be hit­ting its June 19th 2009 release date — instead being pushed back a whole year to May 28th 2010. Rather than con­tend with the likes of Trans­form­ers 2, the PoP movie will now be up against Shrek Goes Fourth and Marvel’s new title, “Thor”. The Hol­ly­wood Reporter have today con­firmed the actors to play the two main roles in the Prince of Per­sia Movie. Jake Gyl­len­haal (Don­nie Darko) has been offi­cially cast as Das­tan, the young prince — a choice I fear many fans will not be happy about. Whilst Gemma Arter­ton (Quan­tum of Solace) has been cast as the princess Tamina. In the fan­tasy adven­ture, Gyl­len­haal will play Das­tan, a young prince in sixth cen­tury Per­sia who must join forces with Tam­ina (Arter­ton), a feisty and exotic princess, to pre­vent a vil­lain­ous noble­man from pos­sess­ing the Sands of Time, a gift from the gods that can reverse time and allow its pos­ses­sor to rule the world. Doug Miro & Carlo Bernard, Jor­dan Mech­ner and Boaz Yakin wrote the script, which is based on the many games cre­ated by Jor­dan Mechner. Bruck­heimer is pro­duc­ing, while Mike Sten­son, Chad Oman and Patrick McCormick are exec producing. Pro­duc­tion is set to start in July. Vari­ety have some impor­tant and sig­nif­i­cant news for us about the Prince of Per­sia movie adap­ta­tion. It seems that direc­tor Mike Newell has been scout­ing loca­tions in Morocco, with stu­dio work tak­ing place at Pinewood, Eng­land. With shoot­ing set to start in mid-June. Choice of Morocco as a shoot­ing loca­tion will be a boost for the North African country’s film biz. “Pro­duc­ers are always look­ing for cheap places to shoot and Morocco is one of them,” said Dune Films’ Jimmy Abounouom, who is rep­ping the Moroc­can shoot for Disney. 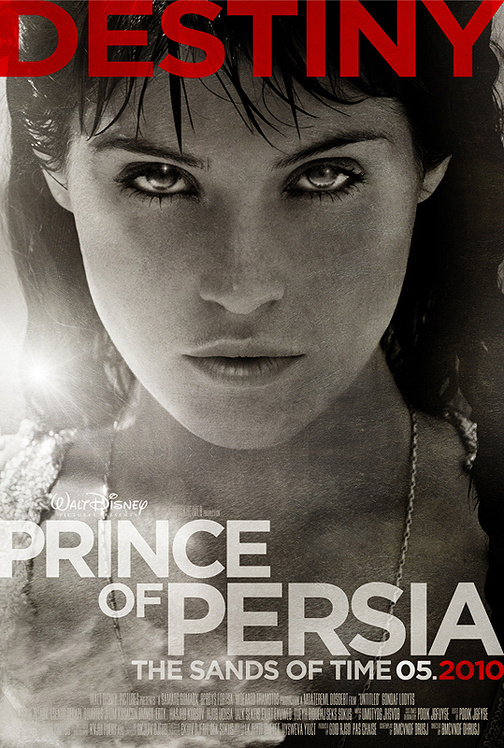 “Prince of Per­sia” will also lens in Blighty’s Pinewood Shep­per­ton stu­dios. Project is in pre-production. Abounouom told Vari­ety he expects the Moroc­can sec­tion of the shoot to start in mid-June, labor wran­gles notwithstanding.